IHG® Rewards Club - eBooks - B.O.O.K. THE B.O.O.K. 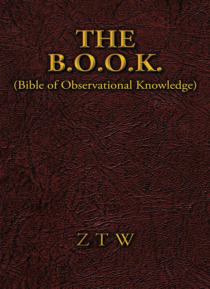 (Bible of Observational Knowledge) is seven books in one. It includes: The Instruction Manual for the W.I.F.E. (Wonderful Idea from Eden); How To Care For Your M.A.N. (Mates Animalistic Needs); How to Raise Your C.H.I.L.D. (Cute Huggable Innocent Little Darling); ZTWS W.O.R.D.S. (Writings of Ridiculous Dumb Sayings); The Book of W.I.S.D.O.M. (Words Instructing Spiritual Direction of M… an); ZTWS T.A.L.E.S. (Tiny Amusing Little Entertaining Stories); and I.N.S.T.I.N.C.T.S. (Interesting Natural Secret Tendencies, If Nature Could Teach Secrets). There is no other book like it. It has everything! The book was written because of a lifetime of study, reflection and experience. The Bible of Observational Knowledge begins in the Garden of Eden and ends with a revelation. The B.O.O.K. is a collection of stories written over many years. Many of the stories and sayings are so different from anything else that I have ever written that I wanted to use a special pen name; a name that goes with The B.O.O.K. Its a book of humor, but hidden in the humor is truth; truth that sometimes touches the heart; makes you laugh, cry, or reflect. There are also stories that (hopefully) are so silly that they make you laugh until you cry, and do so every time you read them. At least they make me laugh every time, but then again Im a little different; Im ZTW.